Recently I have been absolutely blown away by some beautiful pieces of craft work that I have seen on various blogs. There are some genuine master pieces being created by some genuine masters (mistresses?) of their respective crafts and so, I thought that I would share a few of these with you. First is the Twisted Yarn’s rainbow stained glass window afghan. This is truly beautiful and a real labour of love. Second is Kate Chiconi’s tree of life quilt… a gift for her brother that she’s travelling half way round the world to deliver. 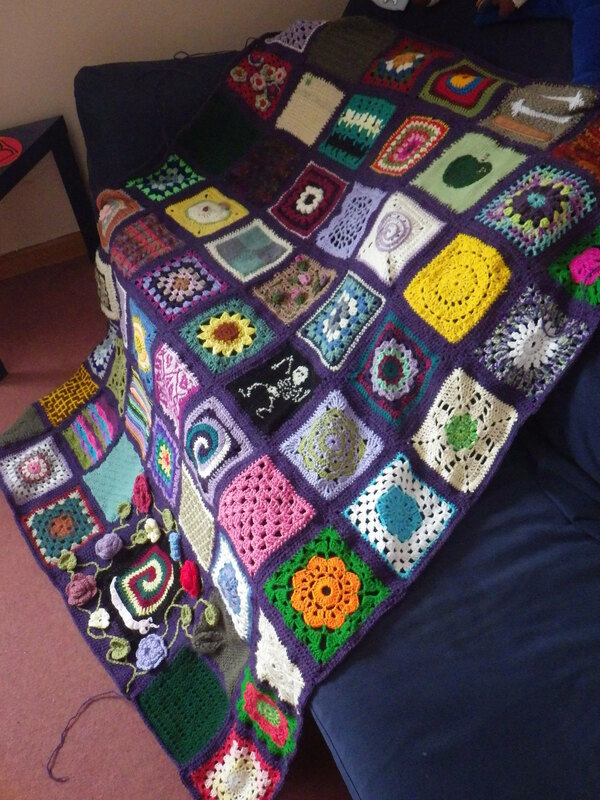 Third is Nana Cathy’s crochet squares blanket… all her own work, unlike my own blanket. Fourth is The Grange Range’s baby boots… so detailed! Fifth is Dani’s Bavarian crochet, which I have to include because I know it is even more lovely in reality than in the photograph. And, finally, for now Mollybean’s slouchy blanket, which she is very modest about, but I think is beautiful. Thank you for the very kind write up! 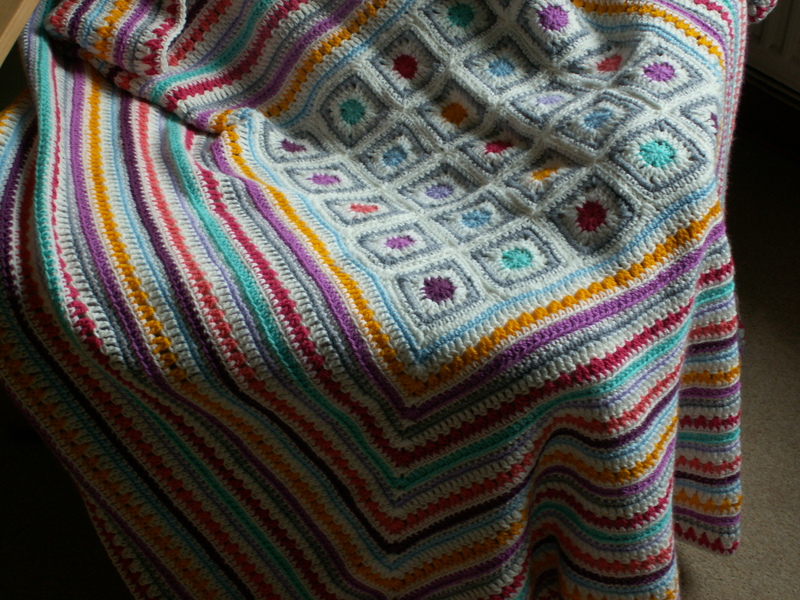 I love the slouchy blanket too, lovely colours and a very pretty design. Mollybean comments on all the mistakes in her slouchy blanket, but we all see those in our own work! To me it is a beautiful creation. Meanwhile, thank you so much for linking to my afghan. I love the other pieces you’ve mentioned, especially the tree of life quilt – that really is stunning. I’m feeling very smug that most of the ends are woven in… and very grateful that most of my contributors have already done it for the individual squares that they send. All beautiful masterpieces, I love Nana Cathy’s squares, I really like that scrappy look. 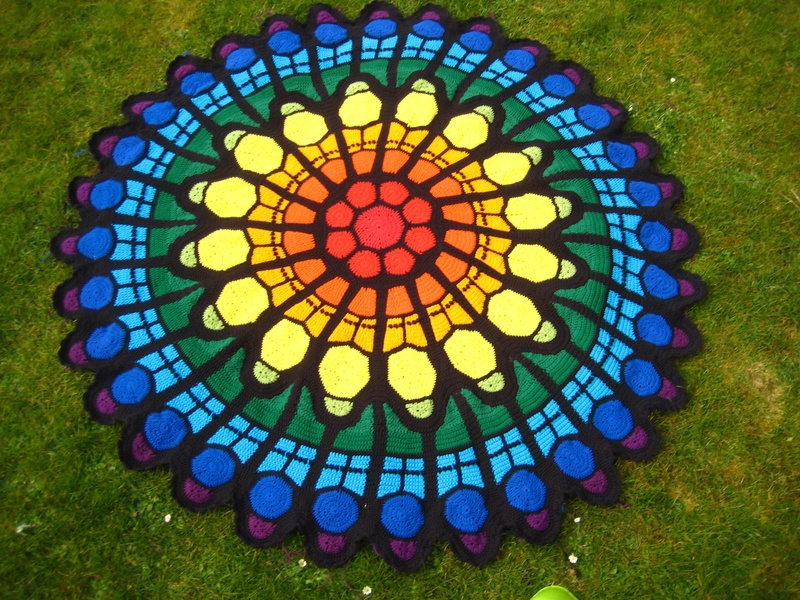 One of the talented ladies in the charity knitting group I belong to knitted the stained glass window afghan to raffle and raise money for the group……it was a stunning piece of artwork, as is Twisted Yarn’s. I’ve just held my square up to the screen to see how it’ll look with the others, quite nice I think. I’m about to write my blurb and then head out to the post office…. I’m sure your square will fit right in… haven’t had one yet that didn’t! Reblogged this on DaniellaJoe's Blog. And I’m still loving working on it. Thank you… the work of so many people has gone into it (as you can see if you check out the Masterpiece page). Thank you….it’s so good to share! I’m blown away by the talent out there. You ladies are a creative bunch. What a shame there isn’t a man out there with work to show. I know there are males who knit so surely there must be some who crochet too. Congratulations to you all on such vibrant and varied product. There is at least one here on WordPress: http://guywhocrochets.wordpress.com/ but they do seem to be few and far between… I’m not sure why, everyone can enjoy a hat and scarf! I love your idea for a Pinterest board! Some lovely work on there. Thanks so much for including mine, I’m thrilled 😀 I was wondering whether to make another, you’ve just made up my mind for me. I’ll start it this week. I was sort of holding out until it’s finished, but I guess that it wouldn’t hurt to have a picture of it as a work in progress. Thank you… do take a look at the others too… all gathered together (plus a few more as time goes by) on the pinterest board. 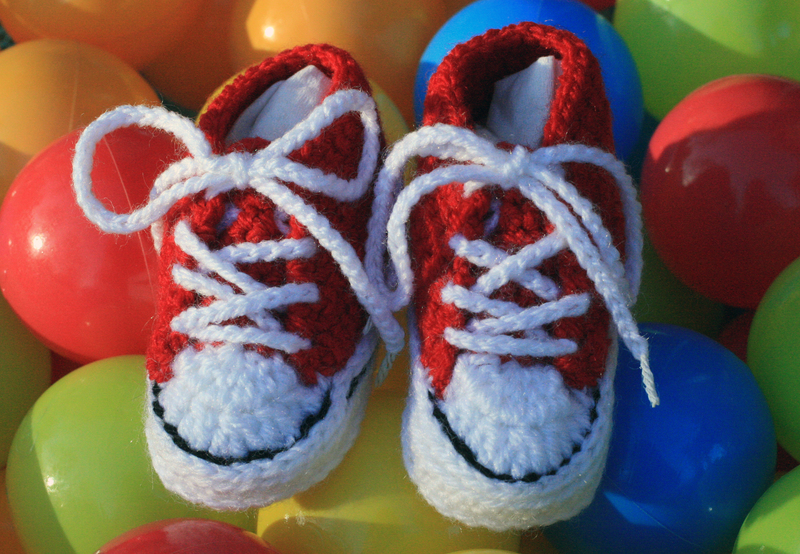 Awww, those baby converse shoes…!!! Anyway, always great to be recommended to blogs with good crafts, thank you! They are great, aren’t they? Your Masterpiece is lovely. So many interesting and beautiful squares.